Peter Parker (Tom Holland) is back to being an awkward high schooler in Spider-Man: Homecoming, and the result is the best outing for the webslinger since Sam Raimi’s first two films. This reboot forgoes any sort of origin story, which is just fine this time around, and instead picks up right after where we first met this new Spider-Man in Captain America: Civil War. Peter is still jazzed by his moment in the spotlight fighting with the Avengers, and is growing restless being stuck at a high school in Queens, New York, where he lives with his Aunt May (Marisa Tomei). He’s desperate to move beyond fighting local crime and actually prove himself as a real hero, seeking more responsibility and freedom than his mentor Tony Stark (Robert Downey Jr.), who keeps Peter under the watchful eye of his chauffeur Happy Hogan (Jon Favreau), is willing to give him. When local criminals start using otherworldly super weapons, Peter takes it upon himself to stop them, and tracks the weapons back to Adrian Toomes (Michael Keaton), a working class scrap collector whose company was tasked with cleaning up the alien junk left behind following the Avengers battle in New York, before losing the lucrative job to officials from Stark Industries. Adrian keeps behind some of the glowing alien orbs and has his team of mechanics fashion them into super weapons to be sold at profit to local criminals, even building himself a flying metal suit that turns him into the Vulture, presenting a much more complicated threat than this “friendly neighbourhood” Spider-Man might be ready for. The young indie director Jon Watts keeps things moving at a good pace, maintaining interest over the 134 minute running time. The big scale action sequences are excitingly done, including a thrilling set-piece involving the Washington Monument on a school trip and another on the Staten Island ferry, but there is also a character-driven element to the film that keeps it grounded. Peter Parker is supposed to have just turned fifteen in this version, and there is a youthful energy to the entire film, with elements of it playing like a high school comedy. If John Hughes had made a superhero movie, this is what it might have looked like, and the filmmakers have even worked in a clever little nod to Ferris Bueller’s Day Off. Although I still think Spider-Man 2 is the best cinematic outing for Spidey both in terms of scope and genuine emotional stakes, Spider-Man: Homecoming comes close to it in terms of sheer entertainment value. This is a very different version of the character than the more subdued and withdrawn qualities that Tobey Maguire offered in the original trilogy, and different again from Andrew Garfield’s take on the character in the pair of reboots that followed. Tom Holland instead plays him as an excitable bundle of nervous energy, which works because he is also much younger than the actors before him. It’s a great take on the character, and a big reason why Spider-Man: Homecoming is so much fun to watch. The other big reason this film works is because of the strength of its villain. Michael Keaton does great work, elevating the Vulture into one of the finest and most grounded antagonists the Marvel Cinematic Universe has ever offered, simply because he isn’t really an evil villain at all. He’s an intimidating and threatening figure towards our hero, but there is also a ruggedly empathetic quality to him because he’s basically just an ordinary working class guy who feels cheated by the system and finds a way to make money to support his business and family, which puts him on the wrong side of the law. He’s all the more interesting as an adversary because of this, and the film does an excellent job of developing his character and giving him his own compelling story arc. Jacob Batalon steals the show as Ned, Peter’s best friend and wannabe partner in crime fighting, who is more than happy to be friends with the hero and hopefully become “the guy in the chair.” Laura Harrier does fine work as the love interest Liz, who plays into the homecoming dance that is referenced in the title, and Zendaya also leaves her mark on the film as Michelle, a high school outsider who will likely play an even larger role in future instalments. Tony Revolori also seems to be having fun with his brief role as the high school bully. Michael Giacchino keeps things moving along with his boyaunt score, even working in a few elements of the classic Spider-Man theme song. Although this is a polished blockbuster, there is also a delightfully homemade feel to parts of Spider-Man: Homecoming, which is a big reason why it so enjoyable to watch. This includes a nicely done found footage-style sequence at the beginning that shows Spider-Man’s time with the Avengers from the perspective of his own video diary, and a closing credits sequence decorated with drawings. I love the little details that have been worked into this film, right down to the barebones red hoodie and goggles suit that Peter has made himself to stand in for the high-tech one gifted to him by Tony Stark. The film even delivers a pretty great twist late in the game that I genuinely didn’t see coming, and gives added stakes the finale. This is a franchise extension that both stands on its own and fits perfectly into the larger fabric of the Marvel Cinematic Universe, delivering a fresh take on this beloved and iconic character. It’s a summer blockbuster that is tons of fun to watch, working as both an entertaining superhero movie and an enjoyable high school comedy, delivering equally on both fronts. When Spider-Man: Homecoming opens, we get a brief set-up to how the events of The Avengers and Civil War play into this instalment of the Marvel Cinematic Universe. The focus then shifts to Peter Parker himself, this time played by young actor Tom Holland. Peter is a regular high school kid, and already has had his Spidey powers for a little bit. In fact, we first met Tom Holland’s Spider-Man in Captain America: Civil War where he made a brief appearance. Unlike the previous versions of Spider-Man we get no real origin story here, and just drop right into the middle of Peter’s dual life as a superhero. In Spider-Man: Homecoming, Tony Stark (Robert Downey Jr.) acts as a mentor to Peter Parker and we see that he has provided Peter with the well-fitted – and completely decked out with technology – Spider-Man suit he uses. After thanking Peter for his help in the Civil War fight though, Stark just drops him back off at his home and tells him if he is needed, Stark’s assistant Happy (Jon Favereau) will get in touch with him. Excited to be ‘part of The Avengers,’ Peter waits and waits to be called back into action, but after months of hearing nothing he starts to get bored and takes it upon himself to find crime to fight. This leads him to stumble upon a huge underground weapons ring run by Adrian Toomes (Michael Keaton), who has salvaged alien parts from the New York Avengers fight and is re-weaponizing them. Toomes is a relatable villain in a way – especially as Keaton plays him – and we see that he really just wants to do what Stark did, because as he essentially says, why should only the rich profit off of weapons, leaving the working class to struggle in the dust? The film plays quick and is entertaining throughout, with the mostly young cast all bringing a fresh and new element to their roles. 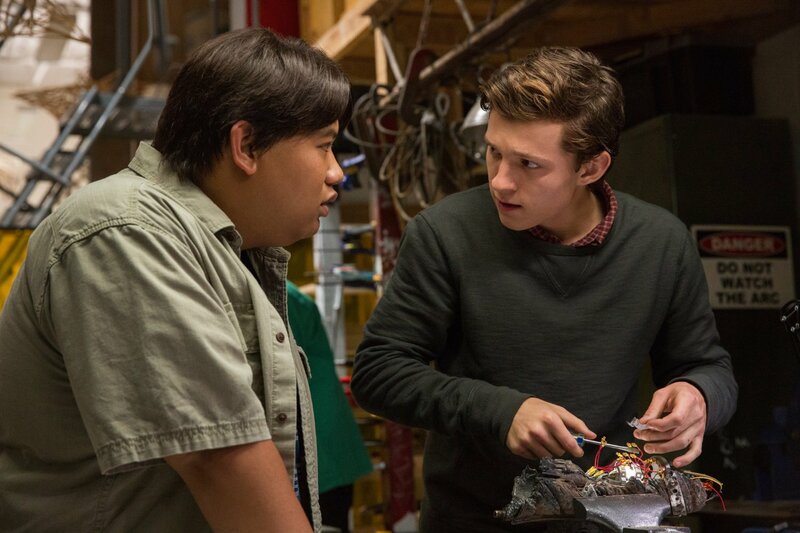 A fun addition is Peter’s best friend Ned (Jacob Batalon) who finds out Peter is Spider-Man pretty early on, and decides that he should become the ‘guy in the chair’ who sits behind the computer and helps fight crime through an earpiece. Overall, there were several little touches here that I quite liked – another one being the version of a ‘suit’ that Peter made himself before getting a Stark upgrade (essentially blue and red sweatpants and a hoodie-vest with goggles). Because how else would a kid make a superhero suit? One interesting thing about another Spider-Man film, is that for many around my age, we grew up watching Tobey Maguire as Spider-Man, and we’ve kept seeing different versions of the character (most recently Andrew Garfield) with subsequent reboots every few years. However, Holland does a good job of setting his version apart and making the character his own. It is a very different portrayal of Spider-Man – one that lives with only his Aunt May, (here a lot younger than in previous versions and played by Marissa Tomei), and with no mention of an Uncle Ben. He also doesn’t work at a newspaper, and is in fact too young to, with the Peter Parker in Spider-Man: Homecoming only 15 years old. This leads one to wonder what will be down the line for this Parker – will he eventually get a job as a photographer? Will an Uncle Ben come into play at some point? It’s not a bad thing to take a different route, since with the many reboots, providing a different line for the story keeps Homecoming feeling fresh. 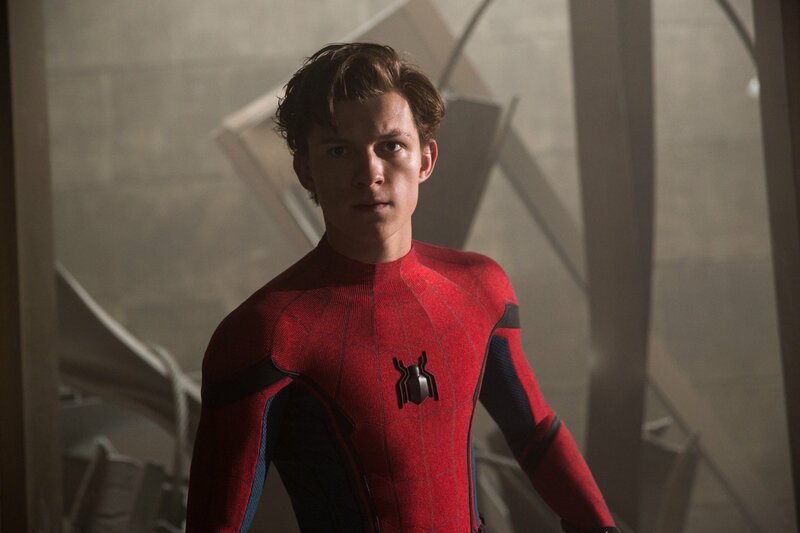 It should also be noted that Holland is the youngest actor to play Spider-Man in recent years, and was actually a teenager when cast in the role. Overall, Spider-Man: Homecoming is an entertaining summer blockbuster that delivers pretty much everything you’d want from a superhero film – the performances are solid and the journey the film takes us on is concise and fits right into the MCU world. I wasn’t sure how this film would turn out, but I liked Holland’s portrayal of the character and Keaton made an excellent antagonist for him. There was also a twist in the film that seemed like it should have been obvious, but I actually didn’t see coming, which made for quite an entertaining raising of the stakes in the third act. For those looking for a summer superhero outing, Homecoming hits all the marks and is easy to recommend. 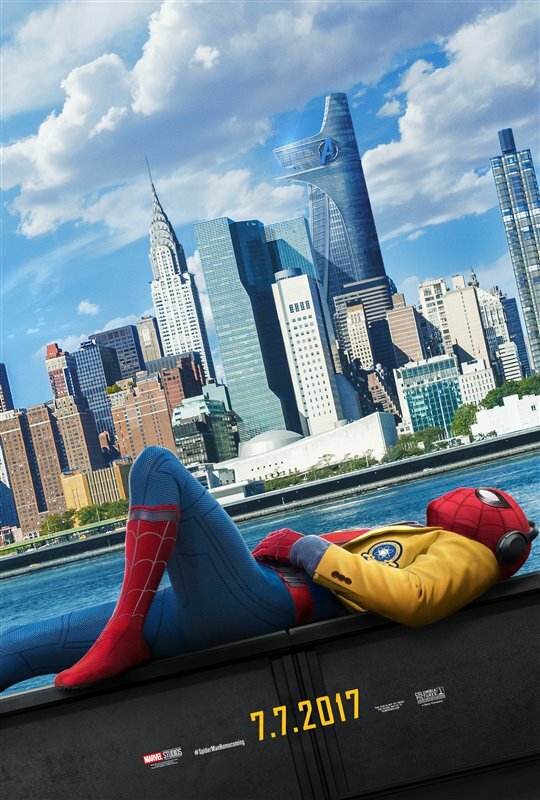 Spider-Man: Homecoming is the latest Marvel film with Tom Holland in the title role, first seen crashing the Avengers’ Civil War in the last Captain America film and now a protege of Tony Stark (Robert Downey Jr.), but still just Peter Parker, the 15 year old kid making his way in a STEM high school in Queens, NY. While flying about thwarting local crimes, Peter finds himself up against the film’s villain, Adrian Toomes (Michael Keaton). Resentful that his salvage business had been taken over by Stark for the Civil War cleanup, Toomes kept back enough Alien-powered material to produce new weapons, particularly a flying exoskeleton that would turn him into The Vulture, with the help of others known to comic fans as the ingenious Tinkerer (Michael Chernus) and violent Shocker (Bokeem Woodbine). Amid all the cool action scenes that are as good as ever, the charm of this film lies mainly in Peter’s interactions with his fellow students. Treated to an all-day marathon of John Hughes films, the young cast were well prepared to fill the roles of the heavy-set geeky sidekick Ned (Jacob Batalon), the rich bully Flash (Tony Revolori), the cynical girl Michelle (Zendaya) and Liz (Laura Herrier), the girl Peter likes. As Peter’s aunt, Marisa Tomei appears much younger than in previous versions, almost a cool cousin like she played in Slums of Beverly Hills. The witty banter linking Spider-Man to the Marvel franchise is well handled by brief appearances of Tony Stark and his assistants Happy (Jon Favreau) and Pepper Potts (Gwyneth Paltrow), and video vignettes from Captain America (Chris Evans) played for the edification of the students. Marvel fans are sure to like this latest film, but even those who are tired of the franchise and wonder why we need a third Spider-Man will be pleasantly surprised.